While Alzheimer’s is a common disorder seniors have, Rhode Island in-home care providers suggest getting your loved one checked out by a doctor. Although it’s quite possible your loved one’s memory loss is caused by Alzheimer’s, there is a chance it could be another illness like the ones below. Lead, aluminum, silver, chromium and tin are some common metals that may be toxic when consumed by people and animals. Poisoning from such heavy metals often causes various cognitive problems. People who have been exposed to high levels of heavy metals will struggle to recall some recent events. Therefore, the short-term memory loss from metal poisoning may be mistaken for Alzheimer’s disease. The early stages of Parkinson’s disease lead to gradual loss of memory. In the advanced stages of this disease, live-in Rhode Island caregivers may notice more prominent symptoms such as shaking of the hands and feet. 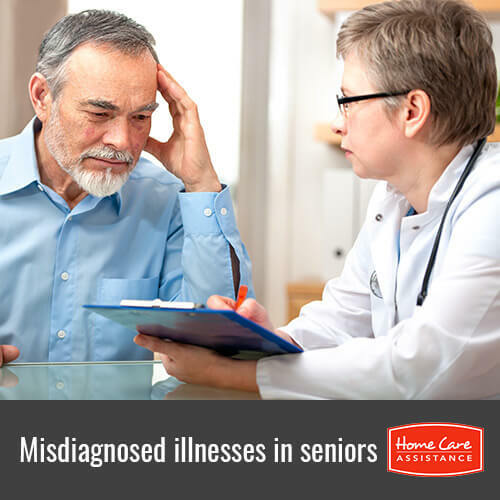 However, doctors often struggle to differentiate between the onset of Alzheimer’s and Parkinson’s disease. It may take well over a year for either one condition to progress to such severity that can be clearly identified. Bacterial and viral infections in any region of the body can affect brain function and hinder memory. For example, senior citizens who get pneumonia can lose some of their memory temporarily. Potent medication that’s used to treat infections further induces some amnesia. Even after a person recovers from a life-threatening infection like pneumonia, he or she might still experience confusion and delirium for many months to come. Since it prevents the brain from fully resting at night, sleep apnea can cause some form of memory loss. Extensive medical research worldwide has shown that this condition directly affects the part of the brain that is responsible for memory and learning. A chronic form of sleep apnea can be mistaken for Alzheimer’s disease or other forms of dementia. When going for an evaluation for Alzheimer’s disease, it’s important for people to divulge their sleeping habits. An experienced neurologist can rule out dementia if seniors complain of having problems during sleep. If it turns out your loved one does have Alzheimer’s, he or she will benefit from Rhode Island Alzheimer’s home care with Home Care Assistance. We provide flexible live-in and hourly care plans that give seniors the confidence to age in place with dignity. We also help seniors carry out daily tasks in a safe and comfortable environment. Learn more by calling (401) 284-0979 today to talk to a friendly Care Manager.